Last night when the mercury soared above 30 for the third day in a row I did not really feel like eating and had used a lot of my BBQ favourites since we were on holidays without hydro for the preceding week. I wanted something to make without turning on the oven or BBQ and risotto came to mind. You only had to eat a little and the leftovers would be a great lunch if your appetite did not return but … with the vegetable preparation and testing the chilled apple wine for the risotto we were ready to enjoy our dinner by the time it was ready! Cliff picked the last of the peas out of the garden, overgrown multiplier onions took the place of leeks and fresh parsley and garlic scapes brought the garden to the table. I like to make risotto when you only have 45 minutes to get supper on the table and you haven’t thought of anything yet. I always keep chicken stock frozen in 2 cup containers and I like to have a package of frozen shrimp to use for meals like this. If I do not have mushrooms I do not worry, I try to find something else. The more vegetables you add the better. Heat chicken stock and keep warm. Cook mushrooms in 1 Tbsp butter until browned then set aside. Cook onion and leeks in same pan with remaining butter or chicken fat until soft. Add pepperette and garlic and continue cooking another minute. Add carrot and rice and cook several minutes before beginning to add the chicken stock. Add warm chicken stock one ladle full at a time stirring to deglaze the pan then continue stirring and cooking uncovered adding liquid as it is absorbed. Add red pepper and peas with last addition of liquid. Put shrimp on top of risotto after final addition of stock and cover to steam shrimp. Check after 5 minutes to see if they are nicely pink and ready to eat. Stir in Romano cheese just before serving. Omit Shrimp and Pepperette and substitute vegetable stock for the chicken stock. 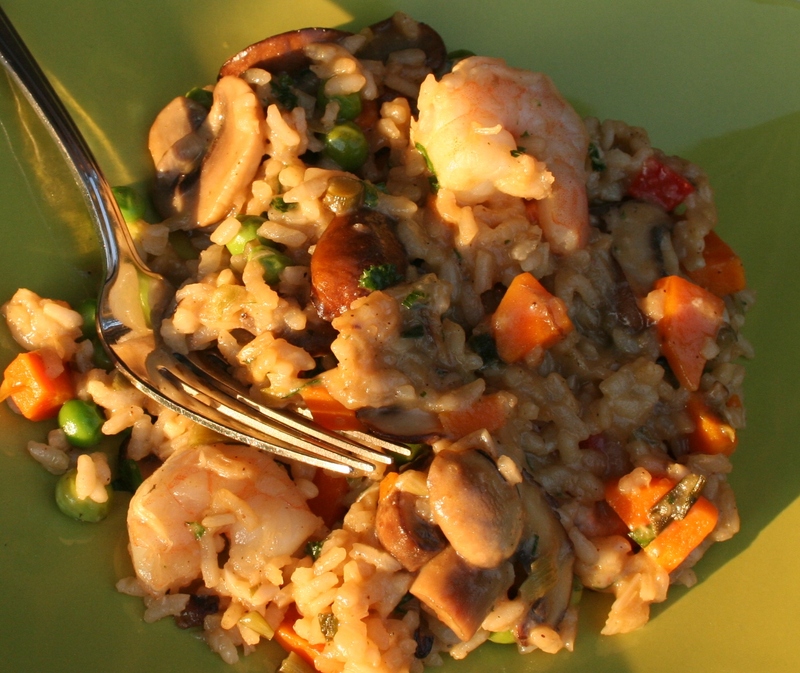 This entry was posted in Original Recipes and tagged Anne's Favourites, comfort food, naturally gluten-free, one dish dinner, risotto, shrimp risotto, summer dinner by Anne's Favourites. Bookmark the permalink.